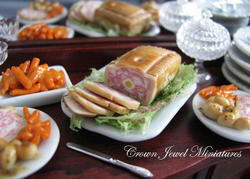 My name is Robin Brady-Boxwell and I've been designing and creating one inch scale dollhouse miniatures since 1979. My passion as a miniaturist began when my fahter and I began constructing a dollhouse from a kit in the basement of our home and my interest continues to grow with each passing year. Several years ago my talents as a miniatuirst were noticed by the owner of a local dollhouse shop, and before I knew it I was selling my miniatures through Dollhouses Plus, Stratford CT. As an artist, I found I could not limit myself to one speciality, and I created everything from miniature food to plants, furniture and jewelry. 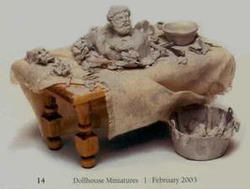 My interest in creating realistic miniature room settings led to my hire at the store and I became the chief consultant for dollhouse interior design. Soon I was helping customers coordinate wallpaper, tiles, molding, wood, lighting, furniture, textiles and other various architectural elements to achieve their miniature dreams. While I still love interior design in miniature, I've discovered a passion for accessorizing miniature furniture. I've 'loaded' everything from china cabinets, to tables, to sewing machines, giving the illusion that 'someone was there'. I loved every aspect of my job and went to all the trade shows but meeting fellow miniaturists and artisans was the most rewarding experience of all. Random people would pop into the shop with their minis, sharing techniques, asking for advice and selling some of the most incredible things and I knew beyond a doubt that I was in my element. The explosion of internet commerce changed everything almost overnight and I watched in sadness as most of the dollhouse shops in New England closed - including the one I was working in. It was a sad time but as one door closes, another opens and armed with experience and and endless resource of creativity, I decided to open my own business online. This door opened the door between me, collectors and artisans from all over the world! In March of 2010, I began Crown Jewel Miniatures, and my constantly evolving range of miniature creations are now sold online through eBay and Etsy.